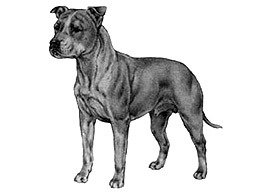 The American Staffordshire Terrier should give the impression of great strength for his size, a well put-together dog, muscular, but agile and graceful. He should be stocky, not long-legged or racy in outline. Head medium length, deep through, broad skull, very pronounced cheek muscles, distinct stop. Muzzle medium length, rounded on upper side to fall away abruptly below eyes. Jaws well defined. Underjaw to be strong and have biting power. Lips close and even, no looseness. Nose definitely black, Dudley nose undesirable. Dark and round, low down in skull and set far apart. Light or pink eyes undesirable. No pink eyelids. Set high. Ears should be short and held rose or half pricked. Full drop to be penalised. Upper teeth to meet tightly outside lower teeth in front. Undershot or overshot mouths undesirable. Shoulders strong and muscular with blades wide and sloping. The front legs should be straight, large or round bones, pasterns upright. No resemblance of bend in front. Forelegs set rather wide apart to permit chest development. Back fairly short. Slightly sloping from withers to rump with gentle short slope at rump to base of tail. Well sprung ribs, deep in rear. All ribs close together. Chest deep and broad. Loins slightly tucked. Well muscled, let down at hocks, turning neither in nor out. Of moderate size, well-arched and compact. Short in comparison to size, low set, tapering to a fine point; not curled or held over back. Not docked. Tail too long or badly carried undesirable. Must be springy but without roll or pace. Any colour, solid, parti, or patched is permissible, but all white, more than 80% white, black and tan, and liver not to be encouraged.